The year was 1962! Mars invaded earth with devastating effect. Now, 50 years later, the menacing terror marches on! Incredible Gentle Giant Mars Attacks Bust available only at the 2012 San Diego Comic Con now can be yours! This hand-painted, limited-edition 8" mini bust offers dozens of details. Featuring authentic accessories, weapon, clear-cast dome and a Flying Saucer themed base. One of the most iconic and memorable Sci-Fi monsters of a generation! Collect this Martian invader before he collects YOU! Total edition size of 550 pieces worldwide. 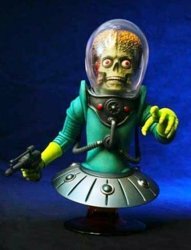 Includes collectible Mars Attacks postcard and colorful packaging. Purchasing Instructions: You must choose your preferred number (out of 550 made) at the drop-down menu above. 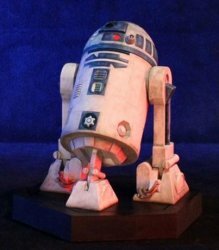 Gentle Giant Star Wars Clone Wars R2-D2 Limited Ed Maquette Statue - NICE PIECE!